I am all about The Christmas Spirit, but the ubiquitous little elf that makes his living spying on children has got to go. Thank goodness my kids are old enough to have missed jumping on this bandwagon, because the last thing I needed back when I was a frazzled mom of toddlers was the pressure to maintain one more thread in the tangled web of lies that is secular Christmas. Don’t get me wrong – I lied plenty. I sprinkled “reindeer food” (raw oats and glitter) in the front yard to attract the sleigh. I left out cookies and milk, and then nibbled at those cookies when the coast was clear. But would I have tiptoed around every night in the moments after the kids fell asleep to cleverly position a toy elf in a charming milieu of holiday magic? Not likely. That was Mommy’s wine time. If you’re unfamiliar with the Elf on the Shelf phenomenon – congratulations on your purity – let me explain. 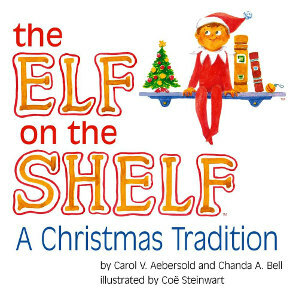 In an epiphany of marketing genius rivaled only by the invention of Beanie Babies and Silly Bandz, a mother and daughter team wrote a book that features a delightful little elf who appears in a different spot in your home each morning leading up to Christmas (his job is to report to Santa on the naughty/nice situation). The only traditional element of this story is how it continues the lucrative commercialization of Christmas, with $16.6 million in sales by 2011 and a steady blizzard of shameless cross-promotions and spin-offs (an animated TV show, a helium balloon in the Macy’s Thanksgiving Day parade, and a new line of birthday products). Although I do not have one of these creepy little urchins under my own roof, I follow the antics of the many shelf elves residing among my Facebook friends. I have some pretty impressive friends who are up to their mistletoe in regular life (work, childcare, cooking, volunteer work, and occasional self-grooming) and holiday duties (sending cards, buying last-minute gifts for teachers and Secret Santas, tasting eggnog recipes), yet they STILL find time to cleverly hide the elf every day AND photograph it AND post it on Facebook so the rest of can marvel at how much energy all this requires. Relax, dear ones. I am already thoroughly impressed if your Christmas card arrives before New Year’s Day and your photo doesn’t include an inadvertent wardrobe malfunction, as in this episode of Seinfeld. As many of my Facebook friends graduate from the Santa years along with me, the elf pictures are a-changin’. 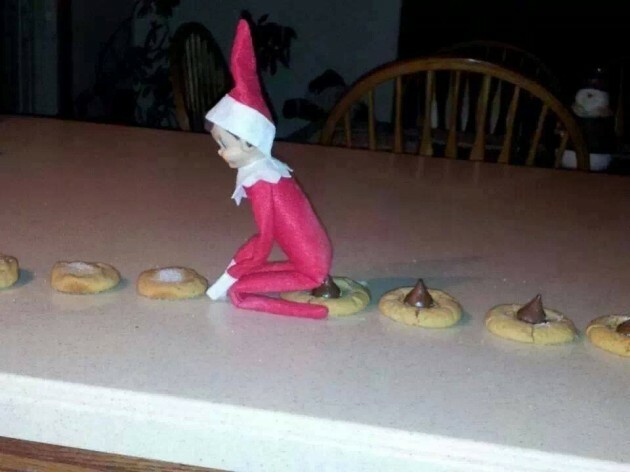 In addition to having endless creative energy, my group of friends has a pretty twisted sense of humor (either that or the elves, having observed so much “naughty” behavior over the years, have become hopelessly corrupted). I guess the evolution of the elf isn’t so different from the evolution of celebrating Christmas with children. When they’re very little, everything is innocent and joyous. As we watch them experience their first snowfall and see their first Christmas tree aglow with lights, it’s hard not to feel the magic of the season. Then a little bit of your spirit dies the first time your child rips open a gift and complains that it’s not exactly what he wanted and why did his sister get something better and why must he write a thank you note if he already thanked Grandma on the phone? As children become teenagers, the entire façade collapses. It’s been many years since I’ve sprinkled reindeer food on the front lawn, and now we simply eat the cookies together before bedtime on Christmas Eve. This time of year, I just want to turn back the clock. I want to go back to the days when Christmas didn’t include the Elf on the Shelf or Facebook. The days before I had teenagers who are more interested in iPads than catching snowflakes. I’ve decided the way to experience the true meaning of Christmas, to re-capture that spirit and innocence, is to celebrate as I did when my children were babies. 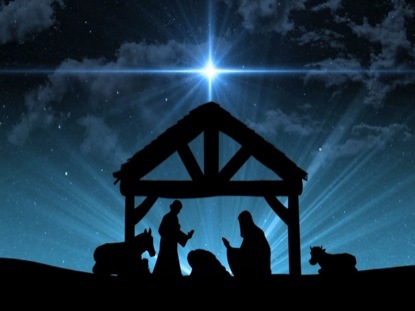 Even better, I should celebrate the simplicity of the very first Christmas, and the very first baby. Remember that? 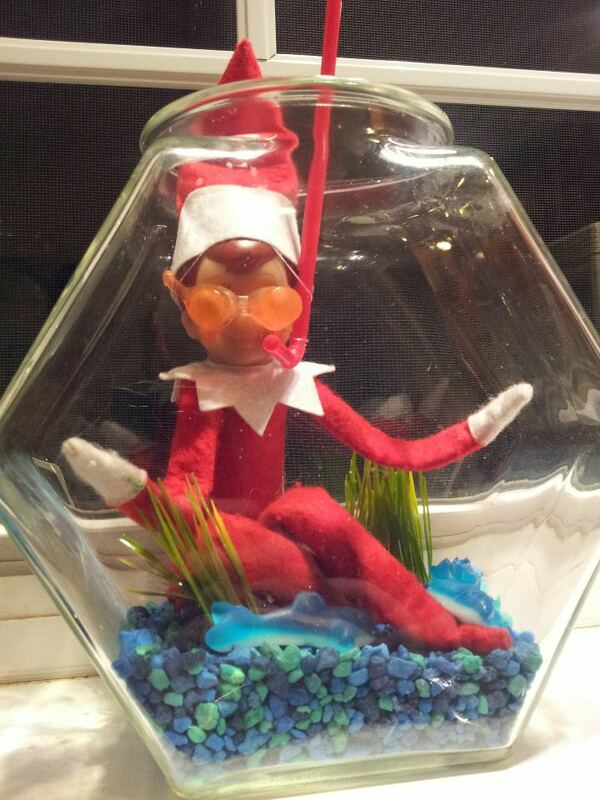 This entry was posted in Observations and Musings and tagged Christmas, Commercialization, Elf on the Shelf, Facebook on December 19, 2014 by lmctaggart2013. Competition among nonprofits for donor dollars has always been stiff, but Giving Tuesday takes the competition to a whole new level. The marketplace of need has never been so cluttered. If you’re reading this blog, you’re online; if you’re online, you’ve seen plenty of appeals for money – these pleas seem to make up at least 90% of online content today. If Giving Tuesday had overlapped with the recent ALS fundraising frenzy, the Internet might have spontaneously combusted but for all the buckets of ice water sloshing around. What’s the best approach to Giving Tuesday, and giving everyday? Which organizations will be the best stewards of your hard-earned money? Even if you believe whole-heartedly in the mission, how can you tell if a particular program or approach is effective? Go ahead – ask for proof. But please don’t ask for too much. Most nonprofit organizations can measure two kinds of things: activity and outcomes. The best organizations generally measure both, but not always. As a donor, it’s important to know what an organization measures and why. Measuring activity is fairly simple. A food pantry tracks how many people come through the door and how much food gets distributed. A community center measures how many teens and adults participate in its programs. A children’s theater counts all performances at inner city schools and the number of children who attend them. Metrics like these used to be enough, but thanks to resources like Charity Navigator and GuideStar, donors today probe deeper. They ask about overhead spending and administrative costs, and they definitely ask about outcomes. Outcomes are extremely important. To demand detailed outcome measurement from every charity, however, can present a burden so great that collecting the data detracts from completing the mission. Let’s use the example of the children’s theater. Let’s say this organization’s mission is to bring age-appropriate performances to underprivileged kids in their school environment. The audience is almost always new to theater and has never seen a play, heard a concert, or experienced performance art of any kind. Their schools can’t afford an arts curriculum and these children don’t have access to art in their homes and communities. If the children’s theater asked for money on Giving Tuesday, would you give? Some donors would ask if the theater’s work makes a difference in the lives of the children then serve. A valid question, but not one that is easily answered. Some of the children who see the shows are profoundly impacted. They may go home and describe the performance to their parents. They may ask their teachers to help them find books about the play. The show may spark a life-long love of theater or storytelling in some. Maybe a fidgety little boy sat at rapt attention for the first time all year, his eyes glued to the stage. Maybe a shy little girl finally came out of her shell at recess, imitating the characters. All of the above are important, positive outcomes, but they are hard to prove. Unless they hire staff to follow up with each school and collect anecdotal stories about student behavior, or unless they create a database of children who see their shows and follow their academic and social progress through the years (privacy rules make this practically impossible), the theater company can’t rigorously prove anything. Does this mean its work has no value? Of course not. Sometimes the burden of proving so is just too high. Trying to measure outcomes might strip scarce funding from the actual theater work, resulting in fewer performances and fewer kids served. The marketing materials probably feature quotes from delighted children or appreciative school principals, but not hard data. As a donor, maybe you’re comfortable with that because you believe what the actors do – that they are making small differences by giving their audiences something no one else will give them. I’m not inherently against outcome measurement – large organizations with multi-million dollar budgets that serve hundreds of thousands of clients can and should invest in the tools to prove their work is effective. But as someone who has seen small, high-functioning organizations take their eyes off the ball because donors were more interested in the scoreboard, I’m wary of outcomes for outcomes’ sake. Sometimes it’s easier to find donors who already believe, and who are willing to relieve their favorite charities of the burden of proof. On this Giving Tuesday, may all worthy organizations find such donors. May we all give generously. 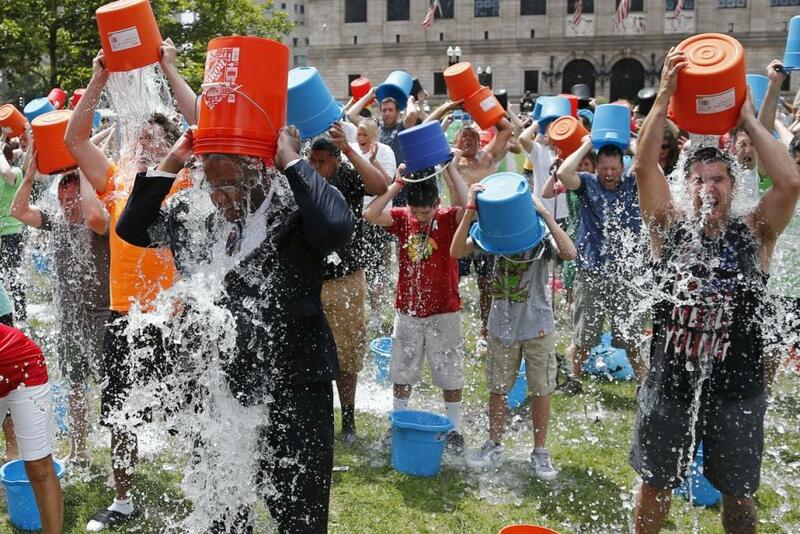 And may we all be thankful that no one is asking us to dump buckets of ice water over our heads again. This entry was posted in Nonprofits and management, Observations and Musings and tagged charities, giving tuesday, ice bucket challenge, metrics, nonprofits, outcomes, philanthropy on December 2, 2014 by lmctaggart2013.